Photographs by Larry Sultan and Mike Mandel. Text by Sandra Phillips and Robert Forth. Distributed Art Publishers, New York, USA, 2003. In English. 108 pp., 25 black-and-white and 61 duotone illustrations, 9¾x9". Out of Print 2003 edition. Signed by Mike Mandel and Larry Sultan. Near Fine condition (light surface marks on front board) in Near Fine dust jacket (moderate rubbing and light wear to the extremities). In 1977 photographers Larry Sultan and Mike Mandel sifted through thousands of photographs in the files of the Bechtel Corporation, the Beverly Hills Police Department, the Jet Propulsion Laboratories, the U.S. Department of the Interior, Stanford Research Institute and a hundred other corporations, American government agencies, and educational, medical and technical institutions. They were looking for photographs that were made and used as transparent documents and purely objective instruments-as evidence, in short. 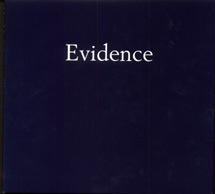 Selecting 50 of the best, they printed these images with the care you would expect to find in a high-quality art photography book, publishing them in a simple, limited-edition volume titled Evidence. The concept for the book was clear: select photographs intended to be used as objective evidence and show that it is never that simple. Now an undisputed classic in the photo world, considered a seminal harbinger of conceptual photography, Evidence is nearly impossible to find. This new edition is being published in recognition of the project's continued relevance, and will contain a facsimile copy of the original book plus a newly commissioned scholarly essay by Sandra Phillips of the San Francisco Museum of Modern Art. Additionally, this edition will include a new spread of images and a group of black-and-white illustrations selected by the artists from an archive of photographs that were not included in the original book.